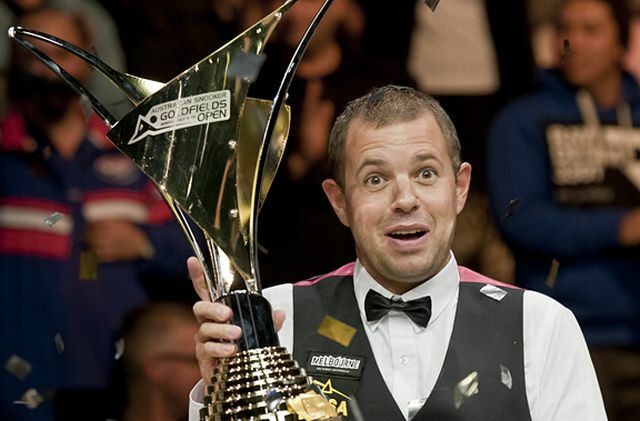 Barry Hawkins won his first ranking event title by defeating veteran potter Peter Ebdon 9-3 in the final of the Australian Goldfields Open. Hawkins, age 33, has been a professional since 1996 and has featured among the world’s top 16 before and won the Shoot-Out last January. But this is by far the best moment of his career so far as he went all the way in the second ranking event of the season. The Londoner takes home a cheque for $70,000 and climbs three places to 20th in the rankings. Ebdon, who was chasing his tenth ranking crown, took the first tense frame during which he fouled after mistaking the brown for a red. But his day didn’t get much better as Hawkins turned on the style winning the next four frames with breaks of 57, 74, 106 and 114. Ebdon hadn’t sunk a ball for just over an hour before he won the sixth frame, helped by a 63, to reduce the deficit by one. Both players won a frame each before the session ended to go into the interval with Hawkins leading 5-3. In the evening session the Hawk soared, winning all four frames. A 133, his highest total of the week, took the ninth, a 74 the eleventh, and a 51 in the twelfth were enough to seal a memorable victory for the Dartford man. He had already won the Bendigo crowd’s hearts with his cheerful manner, and cemented that feeling when he choked up during his post-match interview as he thought of recently wed wife Tara and their son Harrison, who were watching back in the UK. “Winning my first ranking event feels quite strange,” said Hawkins, one of the circuit’s most popular players. “I don’t think it has sunk in yet, I feel quite calm. It’ll probably sink in more when I get home and see the family. I’m delighted obviously and it could be a big moment in my career hopefully. I just can’t believe it, I’m speechless. “The score-line surprised me a little bit because I thought it was going to be a really tough game. Peter’s beaten a lot of good players this week and he’s so tough to play. He plays a lot of unusual shots but really good shots. I managed to have a spell of about four frames where he didn’t pot a ball, I knocked in quite a few big breaks. It didn’t win me the match but it did give me the advantage, keeping him off the table and keeping him under pressure for the rest of the match. “Obviously it’s going to give me a bit more confidence, well a lot of confidence to be honest and hopefully I can win another tournament. But it’s so tough, just to win one is an achievement. To be the last one standing is unbelievable. It’s given me a lot of confidence, a lot of self-belief and hopefully I can win another one in the future. “Even during the good times there’s still doubt, you start questioning yourself thinking am I ever going to win a big tournament. I’ve come close quite a few times but that was quite a few years ago now, and I hadn’t reached a quarter-final for a while so obviously the confidence was lacking a little bit. I’ve been working with Terry Griffiths, just like Mark Davis, for the last year or so and I won the Shoot-Out since I started working with him, I don’t know if it was a coincidence or not. But now I’ve won this so obviously I’m doing something right. Fingers crossed that it isn’t the last one. Ebdon said afterwards: “I didn’t have a very good day at all today, nothing really went for me and I really struggled out there today in all departments and it’s very disappointing. It’s not often that would happen to me in a final but every credit to Barry, I thought he played really, really well. His all-round game was very good, he scored very heavily, his long-game was good, touch, feel, cue ball control, it was all there today.